Pelican Beach Resort has more amenities than any other high-rise in Destin. It is a first class resort. My rates are below the resort rates and any other real estate company. I have several units in this resort with all having unobstructed coastline views of the water. This is a one bedroom with bunks in the hall two bathroom unit located on the first floor. The units are beautifully decorated. I have been self managing my units since the building was built in 1997. I offer nightly or weekly rates - have snowbird rates in the winter. 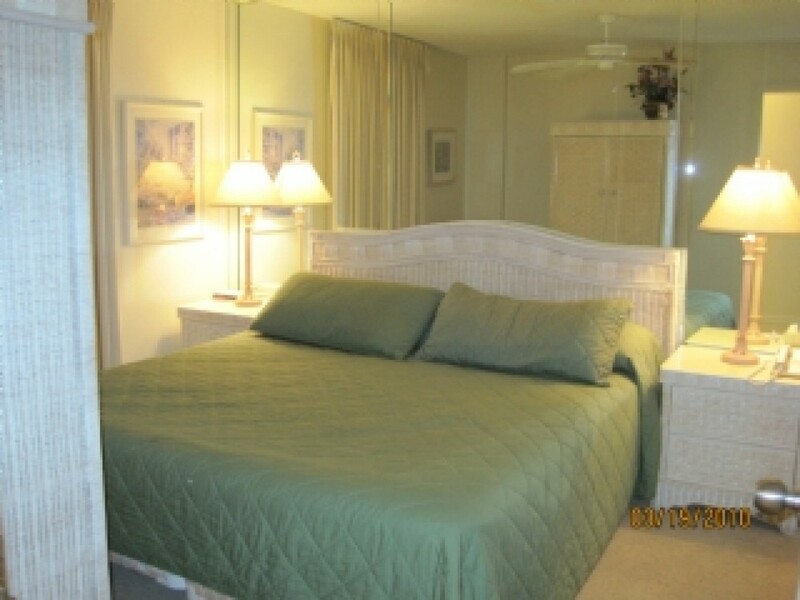 The resort is located in the Heart of Destin across from the Big Kahuna Water/Theme Park. The resort has security at the entrance, covered parking, two tennis courts (at no charge), movie rentals at the front desk, a game room, a restaurant/deli that serves pizza, sandwiches, etc., and also sells beer, wine, etc. to go. It also has a tiki bar overlooking the beach, an indoor/outdoor heated pool, a baby pool, a large outdoor pool with a waterfall, jacuzzi overlooking the beach, beach umbrella and chair rentals, barbecue grills overlooking the pools, workout facility with steam room and sauna (at no charge), and the most beautiful white sandy beaches and emerald green water in the country. The pool, Jacuzzi, and workout facility at the Terrace is also available for your use. The pool there has full sun all day, and the Jacuzzi is attached to the pool, and heated year round. Sorry, no pets are allowed on the resort. There are so many wonderful restaurants nearby. Don't miss the Donut Hole for breakfast and the Back Porch for lunch or dinner. Both are landmarks in Destin. Silver Sands, a large factory outlet mall is seven miles east, for those rainy days (if there are any). The brand new Destin Commons outdoor shopping mall is at the corner of the Mid Bay Bridge and 98. It has a huge movie theater complex, Hard Rock Cafe, Bass Pro Fishing shop, Johnnie Rockets, and all the mall shops you have come to know and love in a beautiful outdoor setting. Fort Walton Beach has a new pier to fish off of that is wonderful. Deep sea fishing is right up the street! Destin was a fishing town before it was anything else, so you can come home with quite a catch. You can take a ride down 30-A to Seaside for some sightseeing. Or you can check out the new area in Sandestin Resort called Baytowne Wharf - lots of shopping and great restaurants overlooking the Choctowatchee Bay. Located eight miles east in the Sandestin Resort on the bayside-don't miss it. For the kids there is bungee jumping, dune buggies, go carts, and a water park right across the street. For the little ones there is a great amusement park a couple miles east on 98. If you want to feel like you have really gotten your money's worth, and have never been to Destin, now is the time to go. No matter how long you stay, it is never enough.